Dogs do much more than detect cancer. YOUR dog can lower blood pressure, heart rate, and overall stress level. Try this simple Harvard Research test, then give us your feedback. Joan Borysenko, PhD made news in her best seller, Minding The Body, Mending The Mind. She suggests not letting your mind become burdened with worry. 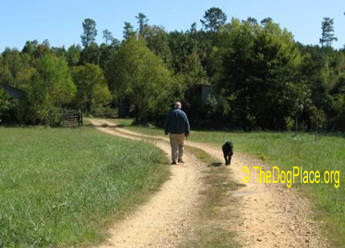 A distraction such as gardening, grooming or walking your dog stimulates and heals the mind and the body. Stress relief? The former Director of two Harvard Medical School Hospitals advises we forgive any wrongs that have been done to us and quit brooding! Let that soak in. Step on your dog's foot and he may yelp and look at you with wonderment because you hurt him but you are instantly forgiven. He may be more cautious about your feet but he bears no grudge. Learn from that as you think how much you love him too. Dr. Borysenko says before going to bed, take a moment and be grateful for something that happened that day. Dog owners can easily do that, recalling how the sun glistened on their dog’s freshly bathed coat, the long-awaited litter that was born healthy, the championship points or qualifying score won that week. She also suggests we imagine seeing a disease leave our body. or a virus or cancer cells being attacked and overwhelmed by an army on white chargers. It isn't like that was her own concept. Visualization was proven two decades ago by forward-thinking cancer researchers. It may sound silly but then if anyone had told us a decade ago that dogs could detect cancer long before medical tests, we wouldn’t have thought it possible. 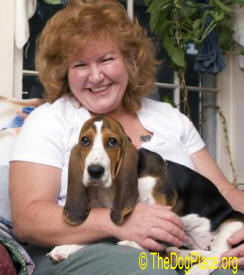 Certainly this doctor would agree that dogs comfort us emotionally and psychologically. 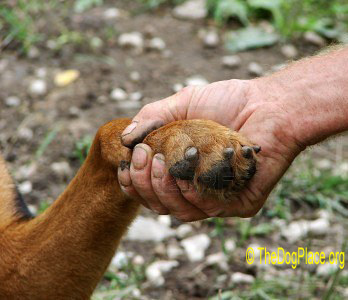 Stroking a dog can calm our thoughts. Dogs make us smile and they are never worried. 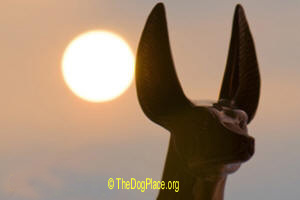 A dog’s enjoyment of the moment and his zest for the simplicity of life should be an inspiration to us. Medical science has proven that stroking a pet lowers heart rate and blood pressure. We know that but did you know that the tactile contact of petting a dog or cat can de-stress a human as well as a tranquilizer and with no harmful side effects? The soothing effect therapy dogs have on seriously ill patients has been well documented but now scientists can hook us up to monitors and prove the effect. So if you are stressed, soak up a big dose of dog therapy! Any dog can become your mental, emotional, and physical therapy dog. Begin by walking the dog every day. Enjoy the exercise and the stimulation of seeing your surroundings from something other than a car window. Savor the relaxing time away from computers, phone, kids, and business. Your dog will invite friendly hellos so stop and chat with a neighbor you normally only converse with by phone. Get tuned in to your dog and he or she will become even more tuned in to you. Your dog may notice that mole on the back of your leg or that your body or urine scent has changed. Pay attention to the dog! Most of all, learn the art of forgiveness from your dog and as the good doc says, be grateful that you have such a loyal, adoring companion and spend a little time just petting and talking to him. It’s good for the heart, the mind, and the soul! Dr. Lee's excellent article (below) on "Dog Spelled Backward" sheds more light on the healing connection between man and dog dating back to the first century. It's unfortunate that most therapists have forgotten what the Pharaohs knew. The fact is: Psychotherapists can heal the human mind. So can a dog. Psychologists can help us to heal emotions and anchor ourselves in the real world. So can your dog. Just ask our wounded warriors who are fortunate enough to have a therapy dog to guide them through PTSD or physical wounds. Try this simple experiment. Turn the TV off. Take the phone off the hook and turn off away from the computer. Sit quietly for a few minutes. Breathe deeply. Then call your dog to hand. Make eye contact and without touching, just reach out to him mentally. It can be something that would evoke a response if spoken aloud. "Wanna go out?" or "Are you hungry?" as you envision yourself setting his food bowl down. Or try something as simple as thinking "You really are my best friend. You know it don't you?" Hopefully this is not what you are thinking "Oh I'm so sad, I just can't go on..." but once the dog "listens" mentally, you can unload your worries on him and he will help you bear that burden. He may be puzzled at first, he's untrained, unsure... but he is a dog and he will sense that you are reaching out to him on a different level. Try it. Really put your mind into this moment. You may have to do it more than once because your dog will sense something is going on but like you, he has to adjust to this simple test. Austin Brown said "I just opened this in my email. I didn't know I subscribed but this was worth it. I have a therapy dog. He is trained but not officially. I depend on him and think it is great that you guys featured these dogs. Keep up the good stuff." Jayne Healy said "I cannot imagine life without a dog. I do not think that you actually realize the influence they have on your emotions and well-being on a daily basis as a part of your life. Go ahead...try it for a year and see how you feel. I was half of a Therapy Dog team for 10 years...I always came home feeling that I got more than the patient. Thank you "Tommy""
We shudder at the thought, but urge owners to use photonic therapies. Man’s health and religious history from Anubis to King James.